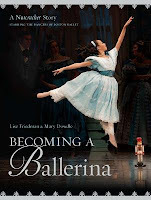 Becoming a Ballerina: A Nutcracker Story by Lise Friedman & Mary Dowdle. Grades 3-6. Viking Juvenile, October 2012. 44 pages. Review copy provided by my local library. Thirteen-year-old Fiona has been dancing for years, but she's about to take the stage in her first major role - playing Clara in The Nutcracker. Butterflies dance in her stomach as she thinks about her journey to get here: years of work, dancing smaller roles over the past several years, multiple auditions. What if she forgets the steps? What if she falls down? No matter what, the show must go on! Beautiful, full-color photos and a narrative text take the reader through the whole process, from Fiona's auditions to rehearsals to opening night. Young ballet fans will find much to appreciate here in the story of one girl's journey to the stage, and I especially appreciate that the authors featured a young Japanese-American dancer. Kids who aren't familiar with ballet may still appreciate the story, but occasional undefined ballet terms might throw them for a loop. This would also be a great book to share with a class or children going to see The Nutcracker. It doesn't go over the plot in detail, but it does give a glimpse of the hard work that leads up to the performance. Fiona talks about how she has to act out everything that's happening because there are no words in the performance. The photos show dancers in various stages of costume, from earlier rehearsals in leotards to dress rehearsals to the performance. There's also talk of the use of props and Fiona practicing to hit the Rat King with her slipper. All of these tidbits would give kids a further insight into the play. I would have loved to see some back matter - maybe a glossary of ballet terms, a list of ballet books for further reading, or an author's note explaining how they worked with Fiona to make the book. But even without those things, it'll serve quite nicely as supplementary material for children interested in ballet or going to see the show. As we get nearer to the holidays, performances of The Nutcracker start up in many cities, so this is one to buy for your library shelves if it's a perennial topic in your community. Pair this with To Dance: A Ballerina's Graphic Novel by Siena Cherson Siegel or A Young Dancer: The Life of an Ailey Student by Valerie Gladstone. 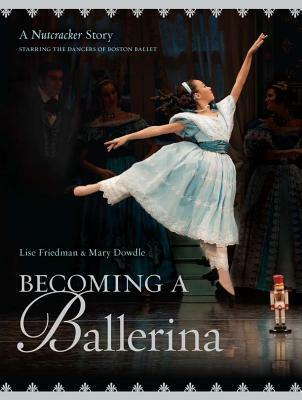 Becoming a Ballerina is on shelves now! Happy Nonfiction Monday! Check out this week's roundup at The Flatt Perspective!